The new 60-tonne (55 tonnes) payload capacity A60H is Volvo Construction Equipment’s (CE) largest articulated hauler to date. Designed for heavy hauling in severe off-road operations, including quarries, opencast mines, and large earth-moving operations, Volvo says the A60H’s long service life, quality, reliability, and durability are everything customers have come to expect from the brand. The A60H is engineered to increase uptime, thanks to its heavy-duty front and rear frames, hitch, and wet disc brakes. Volvo’s long-admired durability along with the support of an extensive array of available warranty options means there’s little to worry about getting the job done; strength being another hallmark of the A60H articulated hauler. Volvo CE has come a long way from the original 10-tonne articulated hauler in 1966—‘Gravel Charlie’. 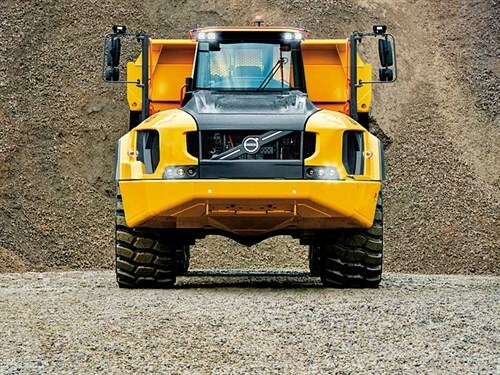 Fifty years and 60 tonnes later, Volvo is still at the forefront of leading articulated hauler manufacturers, having invented the concept and further developing the machines over all those years. Volvo CE says the A60H can help increase a business’ profitability by moving more for less. 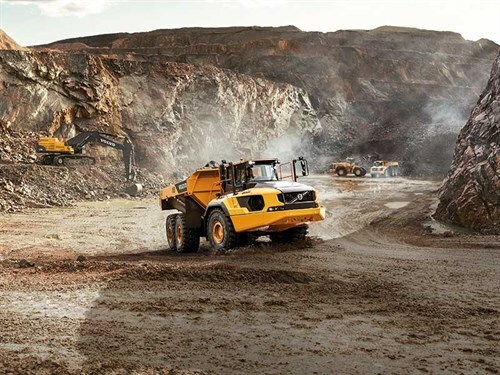 Volvo’s fuel efficiency methods, innovative technology, and vital operational data tools help optimise production and control maintenance costs, maximising return on investment. With a massive 60-tonne (55 tonnes) payload, the A60H can help reduce cost per tonne. Its modern design increases capacity while providing improved fuel efficiency, so more can be moved for less, Volvo CE says. "It is not a coincidence that we launch the A60 the same year as we bring our biggest excavator so far—the 90-tonne class Volvo EC950 crawler excavator—to the market. "In order to maximise output and productivity, these machines should work together," AM Muralidharan, vice president of sales support and dealer development in Volvo CE Region APAC, says. Servicing the A60H is quick and easy, thanks to what Volvo CE says is their industry leading access. The front grill swings down, acting as a service platform with anti-slip steps. The electric hood opens to 90 degrees, combined with electric belly plate, allowing full and safe access to the engine compartment. Volvo CE says meeting production targets faster can be achieved with the A60H by increasing earnings with a higher payload and greater productivity for a lower cost per tonne. They say their ultimate hauler, featuring 100% off-road performance, proven Volvo technology, and impressive payload contribute to sustainable operations, year after year. Being the largest production articulated hauler on the market, the A60H has a bigger payload capacity for heavy-duty applications and, assisted by an onboard weighing system, can deliver up to 40% more productivity than Volvo’s previous largest hauler. 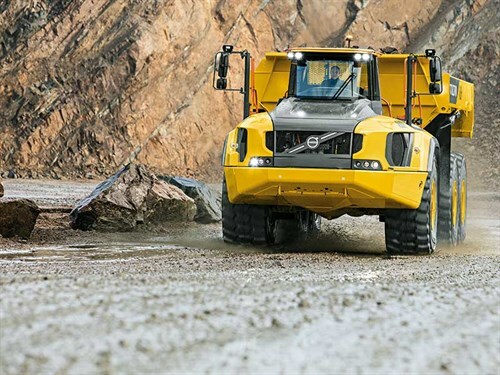 It also embodies Volvo’s full articulated hauler concept, providing total versatility, so customers can access the entire job site and climb steeper gradients, working in all seasons, terrains and applications, using tailored machine configurations and tyres optimised for the 60-tonne machine. The A60H features the latest innovations from Volvo. With matched drivetrain, automatic drive combinations, all-terrain bogie, hydro-mechanical steering, and active suspension, the machine is hard to beat. Automatic Traction Control (ATC) and the 100 percent differential locks continue to be a competitive advantage for Volvo. The no-slip, no-wear differential locks work in 4x6 and 6x6 drive combinations. This industry-unique design employs the front two axles in full-time and the back axle kicks in as necessary, allowing near unmatched off-road performance while reducing fuel consumption and tyre wear. The A60H is also fitted with an active hydraulic front suspension for higher hauling speeds in tough conditions. Volvo CE says the A60H optimises operator comfort and stability during travel, allowing more material to be moved in a shorter time for unmatched productivity. The interior has been designed to provide superior levels of comfort, control, ease of operation, and safety, all with the aim of ultimately safely increasing productivity. The centrally positioned seat, advanced steering setup, quality suspension, low noise levels, climate control, space, and visibility help reduce operator fatigue for more effective operations. The A60H’s dump support system, Hill Assist, and load and dump brake help the operator to stay in control at all times for extra productivity and safety. A number of safety features, such as superior visibility and efficient lighting, help to keep the operator and people working around the machine safe in the most demanding working environments, whether it’s the operator, trainers, mechanics, or site workers.